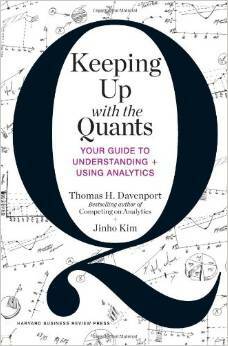 Check out Alden N. Hyashi’s review of the recently published Keeping Up with the Quants: Your Guide to Understanding and Using Analytics (Harvard Business School Publishing) written by Thomas H. Davenport and Jinho Kim. (“Thriving in a Big Data World” in the Winter 2014 issue of MIT Sloan Management Review). The book is written for executives who need to understand big data and its associated science and work with quantitative analysts (“the quants”) who do the actual analytical work. Hyashi describes the book as providing a three-step framework for how to think like a “quant”: framing the problem, solving the problem, and communicating and acting on the results. Data scientists might be a helpful new variety of scientist in our world, but people who know how to ask the right questions to solve a problem are as golden as they have been since the beginning of time.